In the Montane forests of Knysna such as Phantom Forest, we have many shy and elusive forest residents that are seldom seen or heard. Over the next couple of months we will highlight some of these amazing creatures! 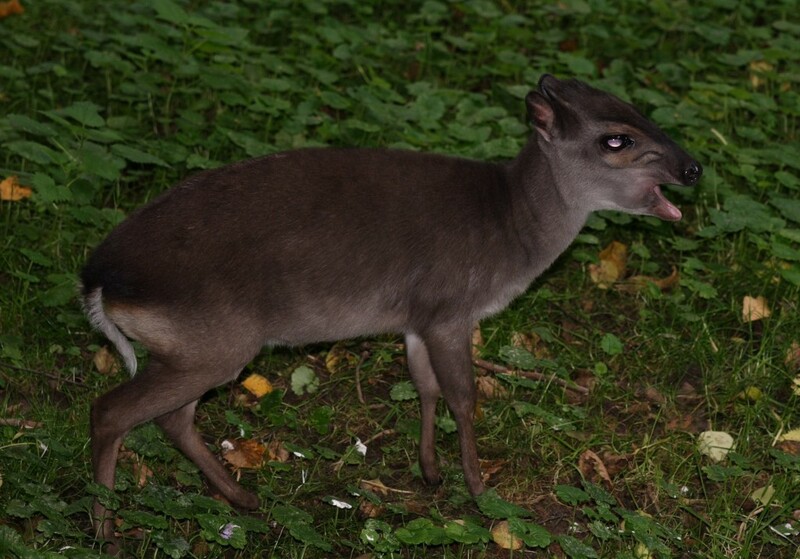 The smallest of all the antelope is the blue duiker (Philantomba monticola), a small, forest-dwelling duiker found in Central Africa and South Western South Africa. Blue duikers stand around 35 cm (14 in) tall at the shoulder and weigh 4 kg (8.8 lb). They have a brown coat with a slight blue tinge – hence the name – and a white underside. A glandular slit occurs beneath both eyes, with a very slight crest between the ears. There is an elongated, oval crown situated on the back of the neck between the shoulder line and the horns, about 2cm x 5cm. It has simple conical horns of 2 to 10 cm (0.79 to 3.9 in). Females do not always have horns, in both sexes horns may be poorly developed, less than 2cm long. The average lifespan is 10–12 years. Blue duikers live mainly in rainforests, where they eat fruit, flowers, and leaves, which have fallen from the canopy, as well as eggs and insects. They are in turn, the prey of eagles and other raptors. They are nocturnal and solitary or form mating pairs. Observations in the Western Cape (Wilderness) indicate blue duikers to be strictly diurnal and not active after dark. They are very territorial animals, patrolling the borders of their territory and marking them with their dung and excretions from glands above their hooves and under their eyes (preorbital glands). They will chase off any intruders and only tolerate their offspring’s presence until they reach 18 months of age. Blue duikers generally produce one offspring per year. Gestation is estimated at between 4 and 7.5 months. Observations in the Western Cape indicate that, under favorable conditions, a female produced a lamb about every eight months for five years. Lambs remain hidden for 56 days (eight weeks) and then make their appearance, about 20% smaller than adult size. A popular activity is to sprint at high speed through dense undergrowth, possibly to practice escape routes. Blue duikers are not at all endangered and are in fact quite common; in Gabon, they can reach population densities of almost 80 animals per km2. This entry was posted in Forest mammals, From the Phantom Forest and tagged Blue Duiker, eco reserve. Bookmark the permalink. A correction- the fine image of a genet is in fact of a South African Large-spotted Genet (Genetta tigrina) and not small-spotted as you have labelled it!